At first glance, these probably look like real lime slices. Now look a little further. Instead of these limes being filled with that yummy, tart pulp that resides in a lime, these are filled with margarita jello. That’s right. Alcoholic margarita jello shots that look just like the lime wedges you are already enjoying with your tequila shots. Ok fine. I should probably say a little bit more about these than that. I’m a big fan of Pinterest. I love to see all the crazy, fun things people come up with every day. A few years ago, I made these Rainbow Layered Jello Shots for a friend’s birthday party. I was inspired by some beautiful photos that I came across on Pinterest. I find myself frequently amazed by the works of art that people seem to be creating out of jello. And the best part? Most of the time it is alcoholic jello. 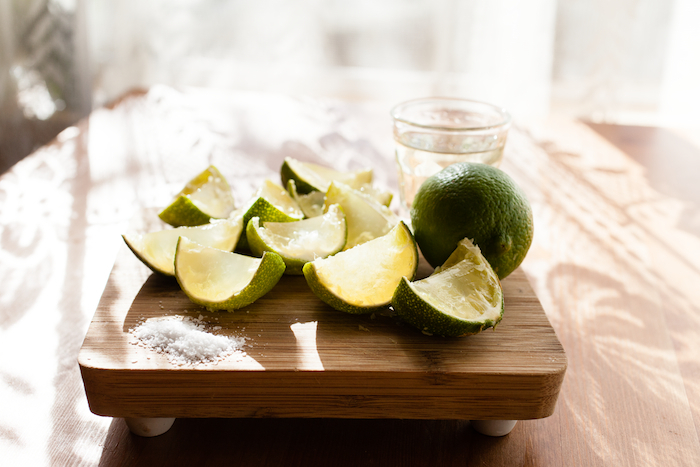 The other day, I had a million limes in my kitchen. I had bought them to make margaritas at a party we attended. We didn’t end up making them and so what to do? I have lots of margarita recipes on here already. (Here, here, and here. Not that you can ever have too many margarita recipes!) So, I decided to come up with something a little different. Let’s just say they are very tasty. They are little slices of tequila/lime deliciousness. You’ll eat a few before realizing that you are doing shots. Other than the cleaning out the lime part, this was a pretty low maintenance recipe. Make them the day ahead for a party. 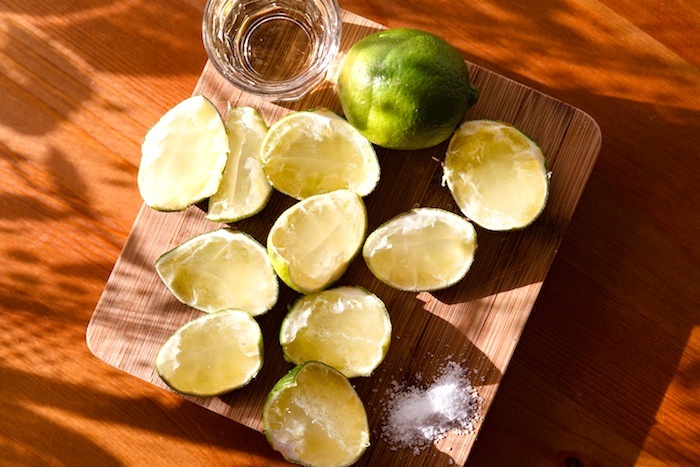 Cut limes in half and juice them. Save the empty halves. Once you have the juice, scrape out the insides of the limes. A grapefruit spoon or melon baller should do the trick. Place them all upright in a small pan, so that they form a bunch of little cups. In a small saucepan, heat lime juice and water over medium heat. Add gelatin and sugar. Stir over the heat until sugar dissolves and gelatin is no longer grainy. Remove from heat. Add tequila and triple sec. Stir to mix and then pout into the empty lime cups. (If there is extra, pour it into a lightly oiled dish and you can always just cut them into squares and eat them later.) Refrigerate gelatin until is set, 3-4 hours. Cut the lime cups in half, creating jello shot wedges. Put them on a plate, serve them up to friends and enjoy! I enjoy you because of your entire labor on this website. Debby takes pleasure in managing internet research and it is obvious why. Most people learn all concerning the dynamic ways you render very important solutions through your web site and as well foster response from some others on that concern then our girl is without question being taught a lot of things. Take advantage of the rest of the new year. You have been conducting a first class job. I do consider all of the concepts you’ve introduced in your post. They are very convincing and will certainly work. Still, the posts are very short for newbies. Could you please extend them a bit from subsequent time? Thank you for the post. I like this site a great deal of, saved to fav. Excellent post. I was checking constantly this blog and I am impressed! Extremely useful information specially the last part 🙂 I care for such information a lot. I was seeking this particular info for a long time. Thank you and best of luck.